Although consumers and businesses are turning more often to Web-based software and mobile apps, many millions still depend on Microsoft Office to get their work done every day. The folks in Redmond want you to use Office wherever you go—on your PC, your tablet, and your Windows Phone handset. To that end, Microsoft is pushing deep integration between its desktop applications and your data, stored on Microsoft servers. Office 2013, the next edition of Microsoft’s flagship productivity suite, is available for business customers but won’t go on sale to consumers until the first quarter of 2013. This review focuses on the desktop applications, which you'll be able to buy either on their own or as part of the cloud-connected Office 365 suite next year. We'll review Office 365 when it becomes available. Both the Office 2013 and Office 365 packages provide online document storage and collaboration. The primary difference between the two? Office 365 is constantly updated, and it lets you run Office away from your main PC via an Office on Demand virtualization tool. Office 365 users get extra online storage and, for the Small Business option, add-ons such as shared calendars and HD videoconferencing. In addition to the highly touted cloud features, the new Office desktop applications look sleeker and deliver several useful improvements. 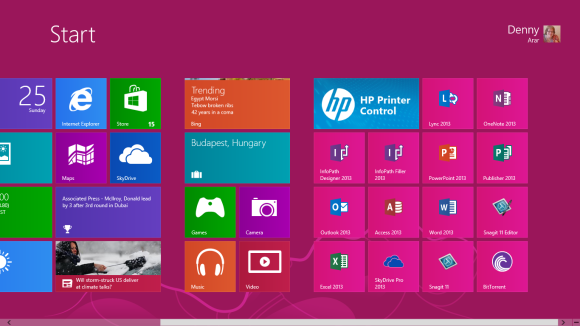 Here's how the Office 2013 icons appear within Windows 8's Modern interface. If you need Office on only a single PC, an Office 365 subscription quickly costs more after a year or so. On the other hand, if you use Office on multiple PCs, you'll find that Office 365 subscriptions—which include five Office 2013 installations and start at $100 a year for Office 365 Home Premium in a single household—are cheaper over several years. The $150 Office 365 Small Business Premium (which is licensed to individual users, not businesses) may be worthwhile for larger businesses that can use its extras. You'll have to do the math for your situation. Word introduces a Navigation pane for skipping through long documents. Microsoft’s Office redesign uses white backgrounds pretty much everywhere, and the net effect is less clutter. A more subtle innovation is the use of animation that can make normal transitions look more fluid (you can disable these effects if you wish). And Microsoft has made several routine operations easier to perform from within the apps. Word, Excel, and PowerPoint no longer show a blank page at launch. Instead, a landing screen presents templates and other options for creating or reopening a document—that’s basically the screen you used to get when you wanted to open an existing document or create a new one from a template. This screen exposes ready-made design options that you might not otherwise consider. Word's new Read Mode can make documents easier on the eyes. The suite also offers easy integration with Microsoft’s online storage options, through the free SkyDrive or, in corporate settings, via commercial SharePoint server accounts. This arrangement makes documents available wherever you may need them. Microsoft has also worked on making Office more tablet- and touchscreen-friendly. One of Word’s most visible innovations is a new Read Mode that dispenses with the ribbon toolbar and lets you see documents as though they appeared within a printed book. In this mode, you can’t edit, but you do have access to find and search tools, so you can perform lookups related to highlighted content. 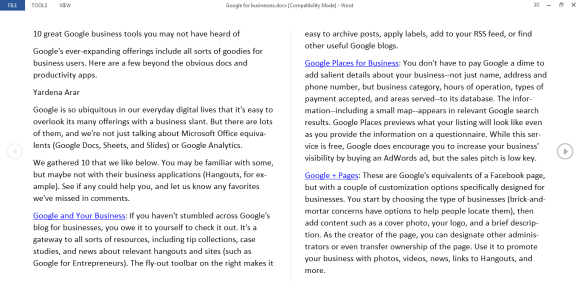 Another new mode provides a navigation pane, useful for getting around in lengthy documents. In Read Mode, you can click graphical elements to enlarge them for closer study (Microsoft calls this object zoom), and then click them again to return to the original layout. You can collapse or hide the ribbon toolbar entirely. Word also automatically bookmarks the page you were last on when you closed a document, and lets you return to that page when you reopen it. That bookmark travels with the document, which means that if you save the document to SkyDrive, your other Office 2013 installations will also open on the bookmarked page—useful when you’re working with lengthy documents. If you're using a connected PC or device, you can watch video embedded in a Word document without even leaving Word. You can also search popular photo-sharing sites for images and add the ones you like to your documents from within Word—no need to save them to your computer first. The same goes for screenshots: The new Insert Screenshot command brings up thumbnails of all currently running apps on your computer, and then inserts the one you choose (after which you can crop it). When you insert an image or other object, Word can reflow the text on the fly so that you immediately see what you’re getting. 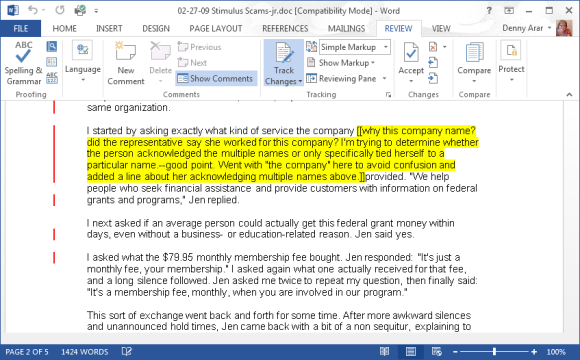 Word's Simple Markup view buries any redlined edits to allow for smoother reading. The new Design tab gathers styles and other formatting options in one place, so you can easily try out different looks for your work. Word also now supports PDF editing (it converts PDFs to Word and then saves them back as PDFs). In my tests, regrettably, Word mangled the formatting somewhat on a complex PDF, but it fared better with simpler forms. 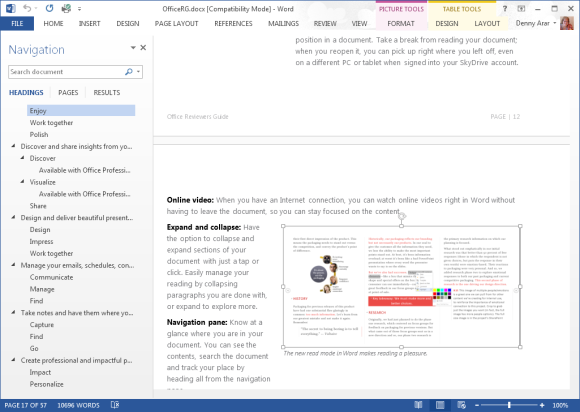 Office 2013 introduces design refinements and usability improvements for connected users, but the price of upgrading may put off Office 2010 users who can get similar cloud functionality with free third-party services.